Mortise cylinders are manufactured in standard sizes and can be used across lock brands. 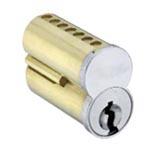 Schlage mortise cylinder can be used in Yale lock and vise versa, though you must make sure you have the correct length of the cylinder and cam installed. Our mortise cylinders are machined from solid brass bar stock, we do not sell cheap die cast cylinders. Our cylinders ship with two (2) keys and a standard cam as standard packaging, other options are available.